Drawn up, fabricated, and assembled in house, this arm attachment just went off to GreenMech to be powder coated. The customer could then have one of their existing cone splitters mounted onto and powered by the new HM10-50KT we supplied. 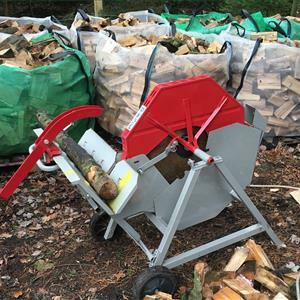 We had previously fitted the Jake mount to the tractor and fitted the Palfinger crane in preparation for this chipper when it came in. For more information of this and other bespoke services offered by Fuelwood, call the office on 01926 484673.